Over the past two years, wildfires have been dominating news headlines and industry conversations. Wildfires are raging in many countries, threatening lives and livelihood. In Canada, the vast majority of commercial operators engage actively in fire suppression, and the variety of helicopters employed speaks for itself, ranging from light to heavy machines. An icon in Canada, the Bell 412 and its predecessor the Bell 212 have been on the forefront of this mission profile in North America for decades. A Bell Flight spokesman confirms that firefighting “is an important segment for Bell and we have been involved in it since we started manufacturing helicopters more than 80 years ago.” The current fleet being used for that purpose in Canada and the United States consists of approximately 25 Bell 412s and 15 Bell 212s, still according to Bell Flight. In Europe firefighting is also a key driver for the helicopter industry. I had the opportunity of visiting southern Spain recently. Recognized for hot and dry weather, with little to no rain for half of the year, Spain is particularly prone to fire. Having seen the beautiful and endless olive tree plantations, one can easily understand the economic impact of uncontrolled fires. When meeting FAASA’s gracious team, notably Gustavo Almagro, Vice President and co-owner and Oscar Martinez, procurement and logistic manager, I understood the pioneering and entrepreneurial spirit the family had to initially establish crop dusting and thereafter fire suppression operations. The second and third generation leaders have now globally expanded operations to Chile, Uruguay and Italy thus leveraging cross equatorial seasonality to optimize aircraft utilization. Over the past 15 years FAASA and affiliated companies have grown from 30 to now over 100 aircraft. The company is also wisely balancing owned and leased assets with strategic partners in its growth strategy. 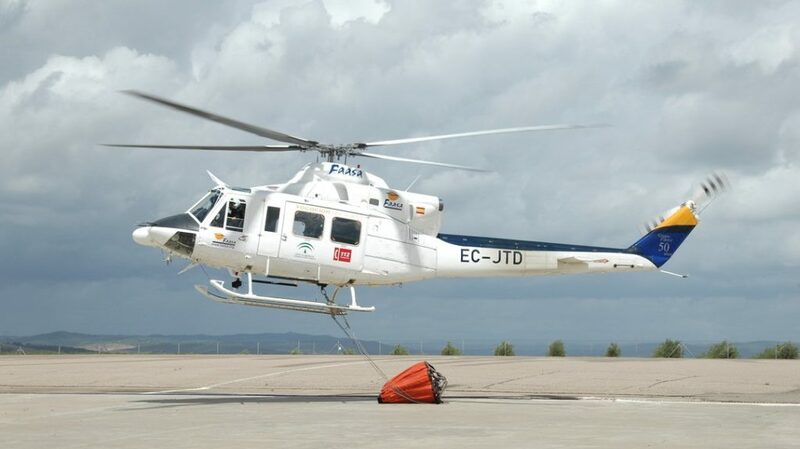 More than half of FAASA’s fleet is composed of P&WC powered aircraft, and unsurprisingly almost a third of the aircraft entrusted with fire suppression is the Bell 412. Benefiting from powerful and reliable Pratt & Whitney Canada (P&WC) PT6T TwinPac engines, these workhorses continue to meet the evermore demanding requirements for contracts, while the well-organized aftermarket allows operators to maintain their fleet at a reasonable cost. Interesting and encouraging indeed to see how companies, similarly across the Americas and Europe, maintain and grow helicopter operations to keep fires in check year over year.